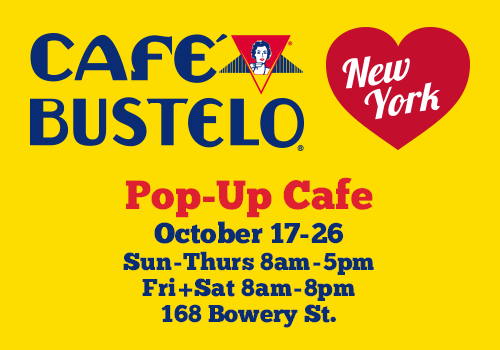 Join Café Bustelo® for cafecito, music, and much more. They're opening the doors to their pop-up café serving their New York friends with complimentary coffee, wi-fi, giveaways, and an exciting line-up of live acoustic bands. Grab a friend and stop by for a Café Bustelo® experience like no other. Check out the schedule below and be sure to like Café Bustelo® on Facebook and follow them on Twitter.